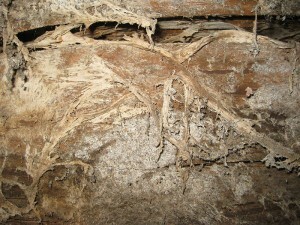 Wet and dry rot both undermine the integrity of the wood that they feed on; both are types of fungi. In many cases the structure of the wood is affected to such a degree, that it can cause major structural problems to the areas affected, all evidence of the infection must be removed, In order to stop the spread. Dry rot needs only a small amount of moisture to start, usually in poorly ventilated areas of the property. Wet rot needs a constant damp environment to flourish. To remedy the problem a detailed survey must be carried out, to determine the causes, penetrating damp, poor ventilation and condensation can be responsible for its existence. Removal of all infected timber is essential, a chemical spray is applied, and brickwork that has become affected must be drilled and injected. Click this link for more information on surveys and guarantees !